Kylie has been a member of Flex Out Physiotherapy since graduating from CSU in 2007 after doing work experience with Kevin Laws throughout her undergraduate degree. Kylie suffered from chronic back pain for many years until she discovered the Muscle Energy Techniques and as a result has a special interest in the treatment of lumbo-pelvic pain and thoracic ring alignment . 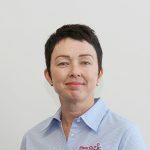 She has completed Treatment of the Spine and Pelvis Level 1, the Integrated Pelvis Level 2, Certificate of Treatment of the Cervical Spine and Thoracic Cage, all of which use the muscle energy techniques, as well as LJ Lee’s the Sports Pelvis and the Sports Thorax certificates, and she is a DMA qualified Pilates Instructor. Prior to physiotherapy, Kylie worked in the fitness industry as both a personal trainer and group fitness instructor while completing her degree, she spent a month in 2012 volunteering in Uganda at an orphanage in Kampala which was hugely challenging but very rewarding, but now spends most of her spare time riding her horse and looking after her farm.